We know you want to deal with specialists when you’re looking for the best in hot tub and sauna ownership experience. 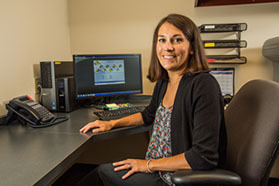 People who know their products inside out – so you don’t have to. That’s why Aqua Vita Spas only sells hot tubs and saunas, nothing else. That’s why we carry only Hot Spring Spas; the world’s number one selling brand of hot tubs. That’s why we carry only Finnleo Saunas; the market leader in traditional and infrared saunas. And that’s why Aqua Vita only serves the residential spa market in Steamboat Springs and the Yampa Valley. 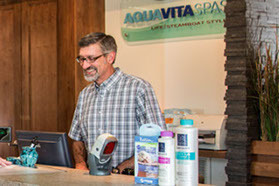 Aqua Vita Spas is a family owned business that has been a pillar of the Steamboat Springs business community since 1979. That’s a long time for a place that has completely reinvented itself in the last couple of decades! 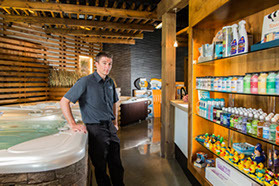 Aqua Vita Spas thrives by staying true to the values of honesty, hard work, and determination – the same ethic that built Steamboat Springs over 130 years ago. We don’t just say we value our neighbor’s trust, we demonstrate our commitment to earning it every step of the way. And we know they appreciate it. That’s why we can proudly point to customer relationships that reach back well over 30 years. 1. Locally Owned and Operated: Serving the local spa market since 1979 has given us a complete understanding of what it takes to satisfy the needs and wants of spa owners in this area. And we use this knowledge to help us provide the best spa products and services available. 2. Experience: For more than 39 years, we have served our clients with spa sales, repairs, supplies, new construction, renovations and related services. This broad range of experience, not usually available within one company, allows us to help you from planning through final installation and beyond. 3. Commitment and Focus: We sell only the highest quality residential spas and related items – there are no sidelines. You have our undivided attention, every day of every season. 4. Integrity: It has long been said ‘A spa is only as good as the dealer you buy it from.’ At Aqua Vita Spas, we’ve built our business on the good opinions of our customers. To do that, we have had to walk the talk, every time. 5. Respect: There are no high-pressure people, or tactics, at Aqua Vita Spas. We want you to be comfortable (and excited) with your spa purchase. We believe that as we take time to educate you about our spas and our company, you will decide for yourself that we deserve your business. 6. Service: Diligently satisfying our customers has always been the heart and soul of our business. We are here to help you before, and after, you have purchased a spa from us. Prompt, competent service is only a phone call away. 7. Value: Service + Quality + Price = Value. At Aqua Vita, we deliver on the whole equation. 8. BBB: We live by the principles above. Our record of good standing with the Rocky Mountain Better Business Bureau is just one reflection of that.